I’ve been sharing my mental health journey with a lot of you, and honestly, it helps! While being vulnerable can be scary, I think it’s good to admit where you are in life in realistic terms. 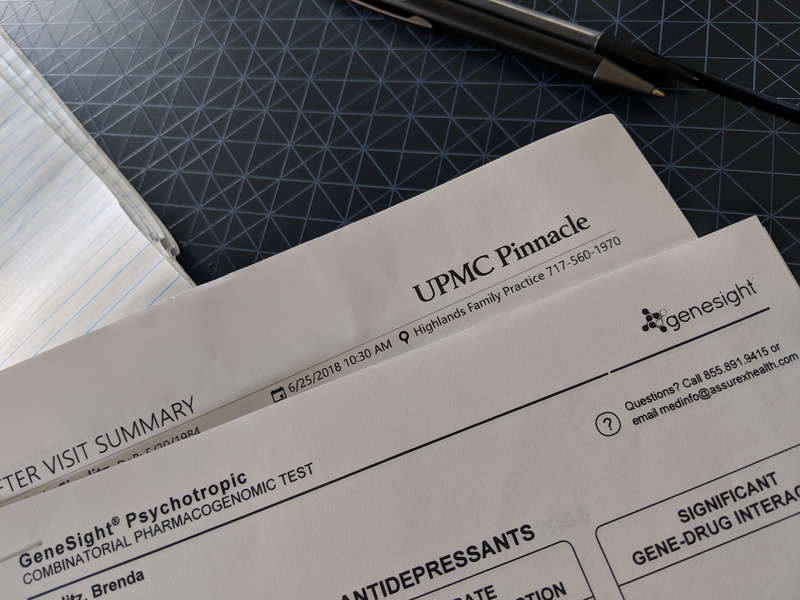 I’ve been waiting on my results from a Genesight Genetic Test to come back, specifically to determine what anti-depressant my body metabolizes best and worst. I only heard about this test 2 months ago and it turns out most insurances now cover it! I have been on Lexapro for 2.5 years. My new family doctor recommended this test after I explained the rough (mental) time I’ve been having and how I feel like my medication is no longer working. It turns out I was on to something. Friends – Listen to your body! My doctor is switching me to Prozac and it will (hopefully) be a smooth transition. I won’t have to wean myself off my current med in order to start the new one. I stop taking one, then start taking the other at the next dose cycle. I left the doctors office feeling excited for the first time in a very long time. Typically when I leave any doctor appointment lately I feel weighted down by everything – by my lack of energy, by my bad nutritional choices, by my horrid menstrual cycle, by everything about my body. Today I felt hope for the first time in ages. Hope that this medication may work to give me back some energy so I can make better choices. I highly recommend asking your doctor about this test if you are on any anti-depressant, anti-psychotic or mood stabilizer medications. The Genesight test offers feedback on all 3 types.